Slice the fruits thinly and arrange them neatly onto a jelly mould or into small cups of same size. Cook agar agar according to instructions on the packet, and fill up the fruit mould. Let it cool then refrigerate till set. Add green colouring into remaining gelatin. I am using Apple Green from Bake King. Let it cool then refrigerate till set. 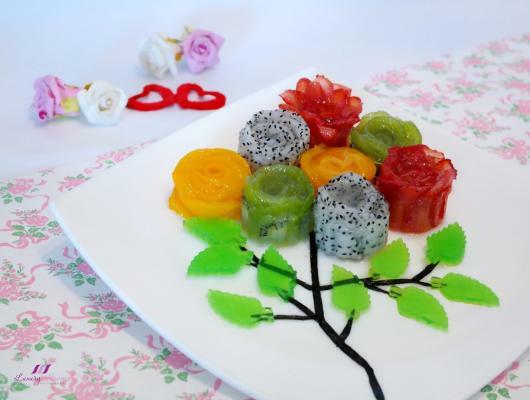 Remove fruit jellies from mould and arrange them neatly on a serving plate to form a bouquet. Cut out seaweed strips to form the stems and align them nicely. Cut out leaves using a cutter if you have, or use fruit pen knife which you can get from any bakery shop. Place the leaves onto the seaweed stems. 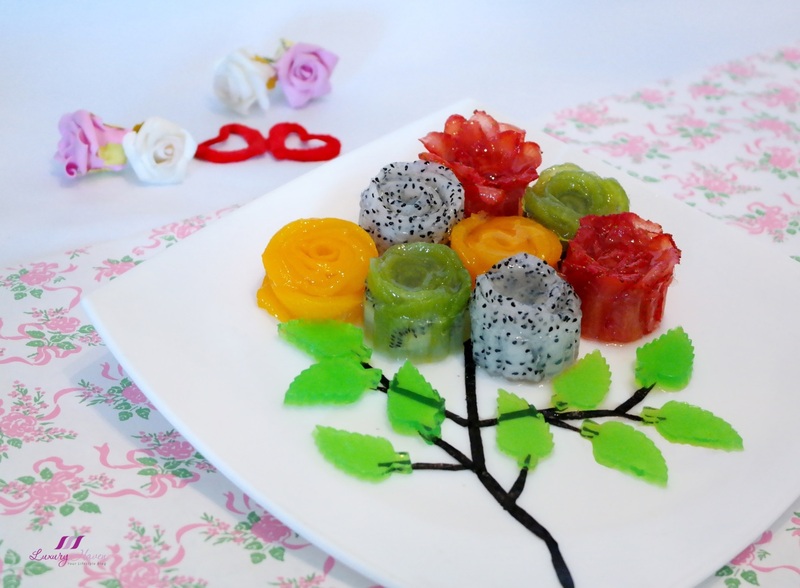 Keep the Valentine's Day Flower Bouquet Fruit Jelly ( 情人节花束果冻 ) chilled until you are ready to surprise your beau! Set the heart flutters with this lovely Edible Valentine's Day Flower Arrangement and let the imagination run wild with your choice of healthy fruits like strawberries, kiwis, dragon fruits and peaches.